Jaimie Cloud, Sustainability Director, is the Founder and President of the Cloud Institute for Sustainability Education. The Cloud Institute prepares school systems and their communities to educate for a sustainable future through teacher education, curriculum design, organizational and leadership development. In 1937 in Bloomington, Illinois, Jaimie’s great grandfather Delmar Duane Darrah bought a series of farms in a circle, so that bad weather affecting some, would not affect all. Those farms have been in the family ever since. 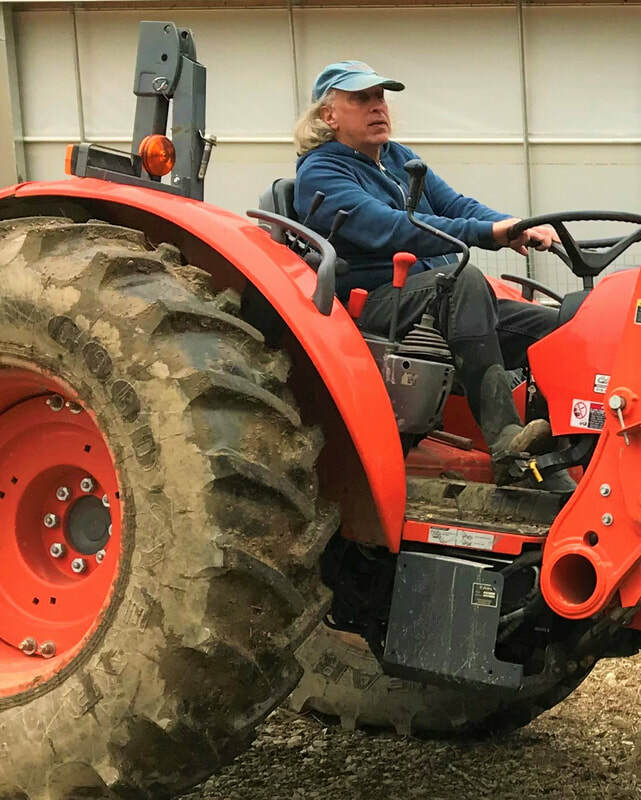 When the last farm was sold a few years ago, Jaimie, her husband David, daughter Gracen and son Griffin decided to sustain the family farm tradition by restoring a farm closer to home in the Hudson Valley using regenerative principles and practices. We are very fortunate to be able to work with the local farm team who runs the day to day operations. The synergy of expertise, enthusiasm and energy is delicious. David Levine, Director of Special Projects, is the co-founder and CEO of the American Sustainable Business Council, a growing coalition of business organizations and companies, collectively representing over 250,000 businesses, advancing market shifts and policies that support a vibrant, just and sustainable economy. He has worked as a social entrepreneur for over 30 years focusing on the development of whole systems solutions for a more sustainable society through building strategic partnerships and broad stakeholders initiatives. Rene’ DeLeeuw, Herd Manager/ Farm Manager, brings to Miracle Spring Farm over 30 years of animal husbandry experience in ruminants, dairy herd management, nutrition, and farming. This expertise will enhance the Demeter bio-dynamic principles that will be followed on the farm. From 2012 to 2016 Rene was Herd manager at Ayers Brook Goat Dairy in Randolph, VT. From 1988-2011 Rene’ was the Herd Manager at Coach Farm Enterprises, Inc., Pine Plains, NY. His herd was recognized in the American Dairy Goat Association Breed leaders in Milk, Protein, and Fat production. Around here, we call him The Goat Whisperer. Nancy Kuster, Sales Manager, recently returned from a transformative 2 years living in the northern highlands of Guatemala, where she was the director of an elementary school. Prior to that, she spent many years in private and Montessori education, believing schools play a major role in shaping environmental/global consciousness and behavior that leads to long-term impacts affecting the future of our planet. ​Originally from Garden City, NY, Nancy raised her two daughters (Julie and Amy) in Madison, NJ. She has been coming up to Ancram to her grandmother’s property her whole life, where she now lives as caretaker at her brother and sister-in-law’s home. Prior to teaching, Nancy spent many years in corporate sales. Nancy met Jaimie when she attended The Cloud Institute program at NJ Learns in 2012 and she is very excited to be working with the Miracle Springs Farm team (including the goats!) and participating in the potential for its future. Jeremy Spesard, R&D Chef, is a lover of both the agriculture and food industries. Having grown up on a farm in Indiana and spending his childhood outside of New Orleans, he experienced a broad spectrum of agriculture, culture, and food. Jeremy is a graduate of the world's premier culinary school, the Culinary Institute of America. After graduating, he spent time working in restaurants in New York City and then privately for families in upstate New York. He is the head grower and recipe developer at Miracle Springs Farm. Michelle is a long time friend of the family. She attended Eckerd College and majored in Math and Chemistry. She currently works as a perfumer in NYC but has worked on farms both internationally and nationally. Michelle's dream job is in ethical sourcing. Griffin attends Pitzer College and is majoring in Sustainability and the Built Environment. He is passionate about social change, community organizing, and urban farming. Gracen grew up in New York City and went to Skidmore College. She is currently getting her masters in Library Science, she wants to be a school librarian. Gracen manages the Miracle Springs' Facebook/Instagram page and created our website.